Michael Crooke is a professor of practice in the Lundquist College of Business, but he also has a side project as a co-founder of a startup looking to make better accessories for raising kids. The company, WAYB — rhymes with baby — started by looking at car seats. They wanted to reimagine the car seat with an aim toward improving them for parents, kids and the planet. That includes focusing on building them with healthier and more sustainable materials as well as delivering one that’s designed for plane and car use. Being on campus, Crooke was already familiar with many of the university’s strengths: green chemistry, applied science, sustainable business practices, entrepreneurship, marketing and sports product management. It just so happened that they dovetailed perfectly with WAYB’s business plan. “Nobody can get close to that,” Crooke said of the combination of skills found at the UO. Those playing roles in the project include faculty members, students and staff, many of whom were associated with the Phil and Penny Knight Campus for Accelerating Scientific Impact and its Master’s Industrial Internship Program. The students gained useful, real-life experience working with Crooke and his team while WAYB benefited from the Knight Campus’ expertise and labs. Crooke brought a robust resumé to the project. He’s a former CEO at Patagonia, along with several other high-profile, outdoor lifestyle-oriented companies. He joined the UO faculty in 2012 as the Avamere Professor of Practice in the Lundquist Center for Entrepreneurship, teaching MBA-level strategy and leadership courses. Another high-profile member of Crooke’s team is Jeff Lockie, who earned his bachelor’s and master’s in business from the UO and played quarterback for the football team. Lockie took a course with Crooke while working toward his MBA and so impressed Crooke that the founder made him one of WAYB’s first hires. Crooke would also consult with colleague Troy Campbell, an assistant professor in the Department of Marketing at the Lundquist College of Business, for insight on how to build WAYB’s brand and mission to galvanize consumers through purpose. He also approached Julie Haack and Hutchison of the chemistry department for their thoughts on materials. Casual conversation quickly accelerated into formal discussions about how WAYB and the university could work together. “The UO’s green chemistry program is world renowned, so once I started talking to Julie and Jim, one thing led to another,” Crooke said. Hutchison saw WAYB’s quest as a perfect project for the Master’s Industrial Internship Program. Its students are given challenging, hands-on immersion laboratory projects before embarking on nine-month internships in industry. However, the WAYB project was no simulation. And they only had three weeks to work on it. 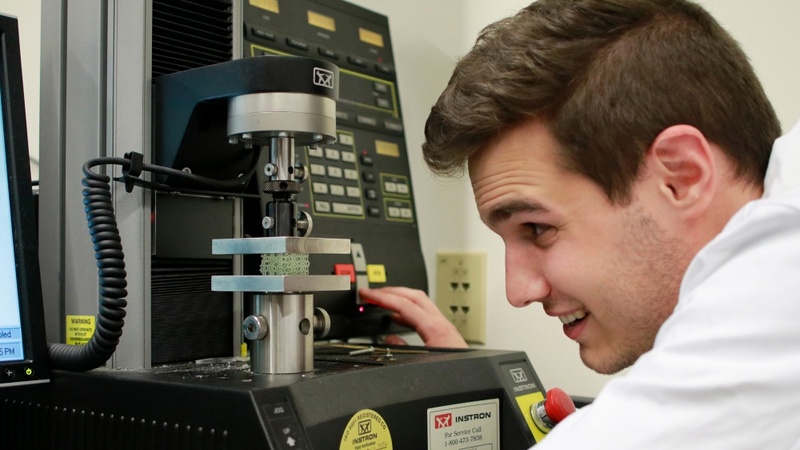 Casey Check, who manages the internship program’s polymer science track and facilities, which are located in the Center for Advanced Materials Characterization in Oregon, said the time constraint was ideal. “It gives a flavor for what it’s like to be out in the real world where somebody brings you a project and says, ‘We only have a short amount of time: What can we find out about it?’” Check said. 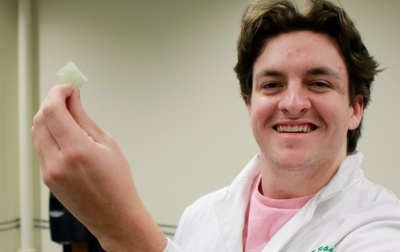 The students evaluated alternatives to Styrofoam to try to find those that could absorb impact forces during a crash while being more recyclable and made from less-toxic materials. The students learned time-management and collaboration skills in the cauldron of a real-life situation as they balanced the project’s demands with others they had to solve. Although they didn’t find a substitute material that met WAYB’s needs in their three-week window, their efforts were invaluable in defining what is needed to invent new alternatives in the future. 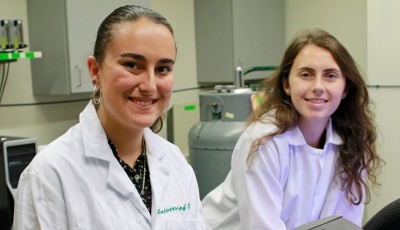 “What we found with the foams we selected was that even though you could improve some of the ‘green-ness,’ you couldn’t get the same performance,” said Aurora Ginzburg, a graduate student in Hutchison’s lab who served as the liaison between WAYB and the students. There was no “right answer,” but the process was eye-opening for the students who saw up close what it will be like for them working in their field. Looking ahead, Crooke expects to collaborate with the Knight Campus internship program on future projects. WAYB already has brought on interns from the Lundquist College of Business’ MBA program and is looking at hiring from the sports product management program in Portland. Lockie said the university is perfectly positioned to contribute to fields such as the one WAYB is looking to shake up. “There’s such a tremendous need for more research and action around sustainable design, and the UO has a better chance than anyone at filling the pipeline,” Lockie said. Check said the Knight Campus and the internship program are ready to help in any way they can.